NOP Design - Free Software! NOP Design's Server Test App is a useful windows utility that retrieves the full contents of a WWW page, including the headers using a direct socket connection without any type of cache. This is extremely helpful if you need to quickly determine if a server is working properly, and don't want to have to deal with browser cache issues, or making proper HTTP headers when doing a 'telnet to port 80' style check. Have one of the cool LynxMotion robotic arms? Want to play with it on your Mac computer? 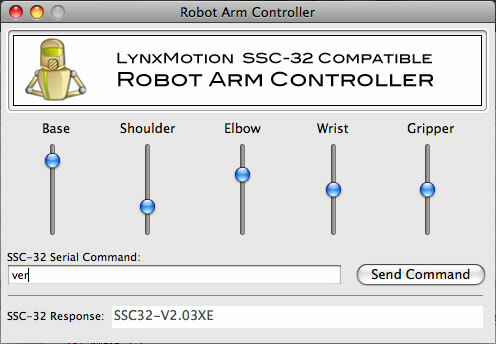 Then download this software to interface with the SSC-32 control board and use your robotic arm. I was tired of constantly having the VMware icon on my windows task bar-- so I wrote an application that hides it. This works great for my dual monitor setup-- as the task bar on the right monitor stays 'clean'. It's free, and helpful for VMware users. Written and tested under Windows XP, but should work for Windows 2000 fine as well. 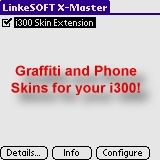 Load skins onto your i330 Graffiti Area, or Phone. This application allows you to load several skins from this site, preview them, and choose the one you wish to make active on your phone. This application makes use of the unpublished Samsung Skin API, and does not use any type of 'system hacks', and won't affect the speed of your i330. Version 2.0 works with your i300 with the Skin Extension below. Have you ever wanted to send a Sprint-PCS 1-way text message (SMS) to someone -- and found your Palm device, or Samsung SmartPhone couldn't do it? Well, now you can. Text Messenger allows you to finally send text messages from your internet-connected (or vision enabled) PalmOS 3.5 or later device. Does not use any external proxies, communicates directly with sprint. Do you hate the quiet palm-os alarm on your i330? Now you don't have to put up with it! 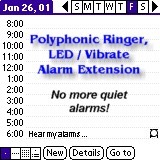 The Alarm Extension is a X-Master extension that lets you use the i330's polyphonic ringers for palm-os alarms! Requires X-Master. X-Master will already be on your i330 from Samsung if you have purchased their roll-up keyboard, or you can downloa d X-Master here. You've asked for it, and here it is! Now you can use the i330 Phone and Graffiti format on your Samsung i300 SmartPhone! The Skin Extension includes an X-master extension tha t allows the i300 to support the newer i330 style skins, as well as the i330 Skin Selector above to manage multiple skins on your phone at once. Requires X-Master. X-Master will already be on your i300 from Samsung if you have purchased their roll-up keyboard, or you can download X-Master here. PalmVNC SE is an enhanced evolution of PalmVNC, specifically for the Samsung i330 SmartPhone. It adds support for the full screen resolutions of the i330, and adds the ability to toggle on or off the graffiti entry area, so you may use the graffiti area to sen d mouse clicks to the remote server, or text entry -- just by toggling a menu option. This distribution comes with both the PalmVNC SE client, as well as the Windows server with scaling extensions. Download size is 1 MB.